There are some jobs that it’s nigh on impossible to do without the right tools – and if you do try to do it without the right tools, you’ll probably end up breaking something instead. Undoing those quick-release chain links after a few months (years – Ed!) is exactly one of those jobs. After a period of time, the general were, tear and stretching of a chain means that the miraculous quick release chain link becomes fused (in a flexible way) to the rest of the chain. splitting the chain should be a simple task of compressing the two sides of the join together… easier said than done. You can juggle with your hands, but that inevitably starts to twist the cain – the precious/expensive chain that you’re keen to protect, which is exactly whey you’ve used those quick-release links in the first place. When your fingers can’t do the job, you’d think that some pointed nosed pliers would do the job, but I can guarantee that they’ll keep sliding off the chain links… if you manage to get away without catching your fingers in those pliers as they slip, they you’re very lucky. 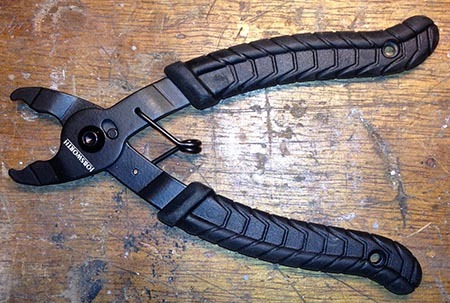 So it’s a simple job… make it as simple as it looks with a pair of these pliers. £5 from Planet-X to buy their Jobsworth Pro Master Link Pliers was probably one of my best investments tool wise… afetr the simple allen keys.